In AD 622 Muhammad, the prophet of Islam, moved from his home town, Mecca, to join his supporters in Medina. This event marks the beginning of the religion of Islam. Soon after Muhammad died in AD 632 his teachings were collected in a book called the Quran. Over the next 100 years the military expansion of Islam completely changed the balance of power from India to Spain. Around AH 35/AD 656 a power struggle among Muhammad’s successors led to a split into two sects which remain to this day as Sunni and Shi‘ite branches of Islam. The first Dynasty of rulers was the Umayyads. In AH 136/AD 754 they were completely wiped out in a bloody coup, with exception of the rulers in far off Spain. They were replaced by the Abassid dynasty which lasted until AH324/AD 936. Now Islam has over 1.7 billion adherents – 23% of the world’s population. Many of the beliefs and traditions of today were established at the time these coins were produced. At the rise of Islam the major power in the Middle East was the Sasanian Empire, based around what is now Iran. The Sasanians issued silver coins called drachms that were inscribed in the ancient Pahlavi script. These showed a stylised portrait of the ruler on the obverse and a Zoroastrian fire altar with two attendants on the other. They also showed the regnal year and the mint signature. 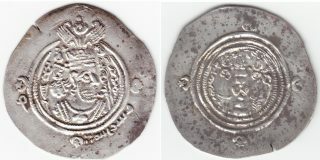 Following conquest of the Sasanians by the Muslim armies the Arab authority initially continued using the Sasanian designs and inscriptions on the drachm. These coins are distinguished by the inclusion of an Arabic inscription on the obverse margin. The earliest of these date from AH 31. From around AH 79/AD 698 a truly Islamic coinage was introduced. It consisted of a silver dirham that was slightly smaller than the drachm, a copper fals and a gold dinar. These coins were not allowed to show images of people or animals and are quite plain looking. They show the Hijra date and the silver coins show the name of the mint. There are over 60 mints known from Arabia and Afghanistan through North Africa to Spain. Remarkably, coins of this period over 1300 years ago survive in large numbers and good condition. Islam uses the Hijra calendar which is based on a lunar year of 364 days starting in AD 622. The year has the designation AH. To approximately convert an early AH date to AD simply add 621 plus 1 year for every 40 AH years. For over 400 years the Sasanian Empire ruled the area now known as Persia or Iran. They issued an extensive coinage in gold, silver and bronze.There are some useful websites on Sasanian coins that can be found with a simple search. This is a silver drachm struck under Sasanian king Khusro II in year 28 of his reign – AD 618, a couple of decades before the Arab invasion. His portrait has a winged crown. The mint name is Rayy, which has an uncertain location in southern Iraq. 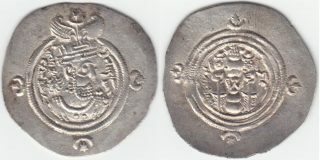 After the invasion and conquest of the Sasanian Empire similar silver drachms with and additional Arabic inscription were issued. This is an Arab-Sasanian drachm struck in Yazd mint in AH 60/AD 680 in the name of Ubaydallah ibn Ziad but still using the portrait of Khusro II. It is easily distinguished from Sasanian issues by the Arabic inscription meaning “In the name of God” in the obverse margin. The Islamic coins from these early years have survived in significant numbers and there are numismatists who have made detailed studies of them. As each coin is dated and has the mint (one of around 70! for the silver coins) there are lots of combinations. Some are very rare today. LEGENDS ON SILVER DIRHAMS. The centre of the obverse translates as: “There is no god except Allah. He is alone. There is no partner to Him”. The legend around the margin of the obverse carries the numismatic information. It translates as: “In the name of Allah this dirham was minted in (mint name) in the year (Hijra year)”. The legends on the reverse are texts from the Quran. This is a silver dirham struck under the Umayyad Caliph Walid I. It was struck at the Dimashq (now Damascus) mint in AH 95/AD 714. 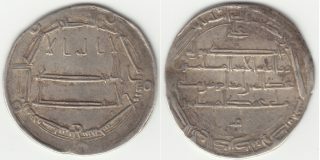 Dimashq was the mint for the gold dinars that were issued alongside these silver dirhems. This is a silver dirham struck under the Abbasid Caliph Rashid. It was struck at the mint of Balkh in AH 189/AD 805. Balkh is now an abandoned ruin in Afghanistan.